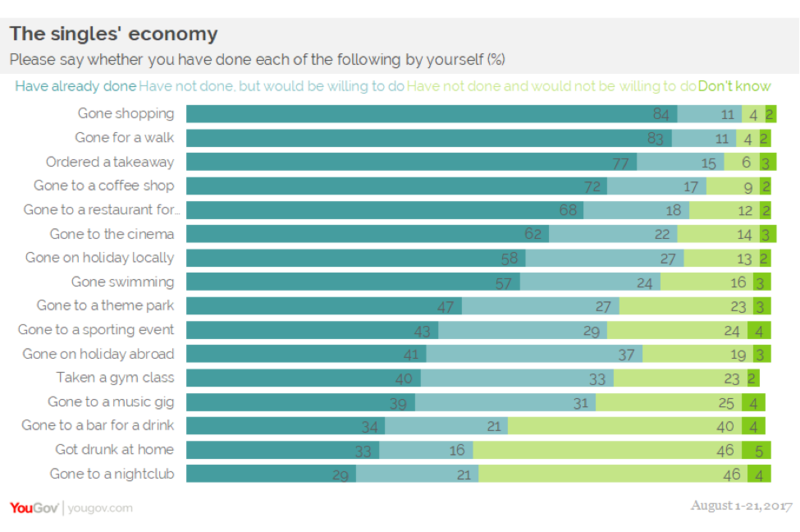 YouGov | Tapping into the singles’ economy: What are the most popular activities consumers do alone? Tapping into the singles’ economy: What are the most popular activities consumers do alone? on September 12, 2017, 11:28 a.m. Being single has its advantages – not least the freedom to do what you want. You can go, see and do whatever you like without having to compromise for anyone else’s sake. But are people willing to do so? Humans are social beings, after all. That’s why new YouGov research has looked at which activities people are most to take part in on their own. Unsurprisingly, the vast majority of respondents have gone shopping and for a walk by themselves, with 84% and 83% respectively saying they have done so. Other popular solo activities include ordering a takeaway (77%), going to a coffee shop (72%) and going to a restaurant for dinner (68%), with the majority of people saying they have done these by themselves at some point. At the other end of the scale, going to a nightclub alone is the least popular activity, with just 29% of people saying they have ever gone by themselves, compared to the 46% of those who say they would never do so and would not be willing to do so. 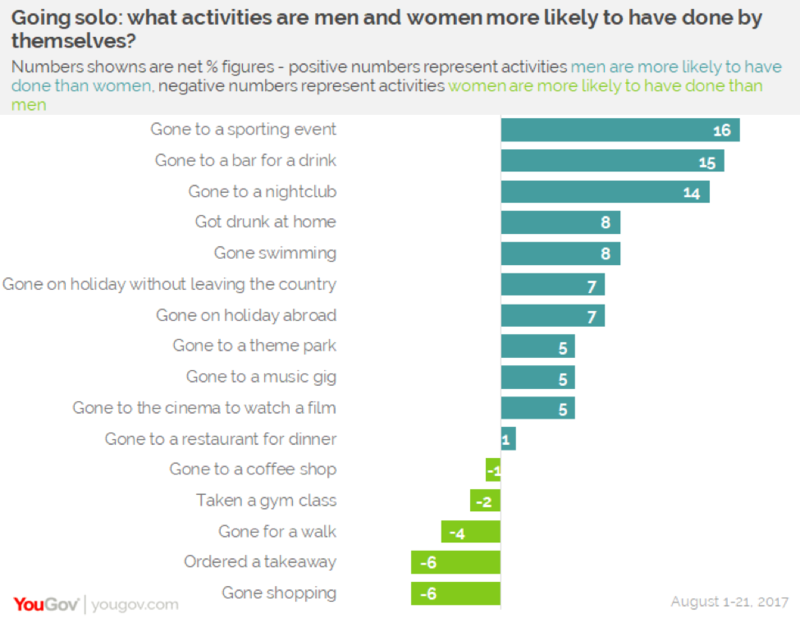 Other top activities that people would avoid doing by themselves include getting drunk at home (46% say they would never do so) and going to a bar for a drink (40%). The activities that most people have never done by themselves but would consider doing include going on holiday abroad (37%), taking a gym class (33%) and going to a music gig (31%). For the most part, men are much more likely than women to have taken part in any of these activities by themselves. This is a conscious choice on the part of women: rather than being willing but yet to indulge in these activities alone, women are specifically against doing these things by themselves. Going solo to a sporting event is the most divisive activity between the genders. Half (51%) of men have gone to a sporting event by themselves, compared to a third (35%) of women. By contrast, nearly a third of women (29%) would not be willing to go to a sporting event alone, compared to just one in five (19%) men. Other particularly divisive activities include going to a bar for a drink, going to a nightclub and going swimming. Some of the differences are obvious – men are simply more likely to be sports fans than women – whilst others could indicate different motivations between men and women for taking part in certain activities. For instance, in the case of going to a nightclub it may well be that for women spending time with friends is the entire purpose of the venture, whilst for men it might be that going to a nightclub serves more as a means to an end. The latest YouGov Omnibus survey suggests that the singles’ economy is big business. Not only are consumers already pursuing a number of activities on their own but they are also open-minded about expanding the range of activities they do solo. The challenge for brands is now to give them the opportunities and confidence they need to take that next step – giving them the motivation to explore new experiences.